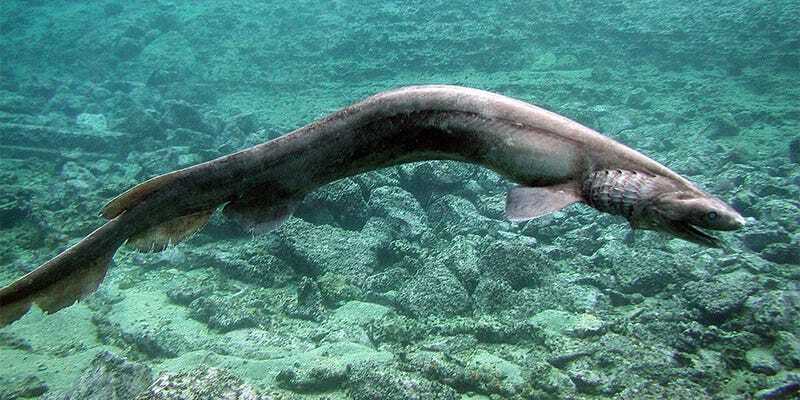 Frilled sharks have been around for 80 million years, but they are very rarely seen. So it was quite the event when one of these "living fossils" was snared in an Australian fishing net last week. According to a press release issued by the South East Trawl Fishing Industry Association, the shark, named for its sets of frilly gills, was "near maximum length" (around six and a half feet long). The frilled shark may capture prey by bending its body and lunging forward like a snake. The long, extremely flexible jaws enable it to swallow prey whole, while its 300 needle-shaped teeth aligned in 25 rows make it difficult for the prey to escape. Some literature suggests its body shape allows it to feed along crevices on cephalopods, bony fishes and other sharks. A large liver packed with low-density oils and hydrocarbons allows it to maintain neutral buoyancy at depth. "I've been at sea for 30 years and I've never seen a shark look like that," the man who caught the eel-like creature told news station 3AW. The head on it was like something out of a horror movie. It was quite horrific looking." Top image via Intact Nature; middle image via 3AW.